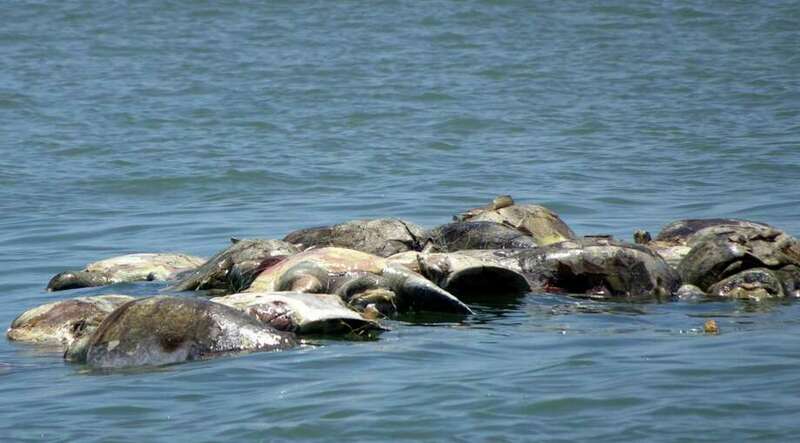 In a horrifying scene, the corpses of some 300 endangered sea turtles were found floating in a massive fish net in the waters off southern Mexico. The Mexican government's Federal Environmental Protection Agency (Profepa) reports the olive ridley sea turtles were found three miles off the coast near the beach community of Puerto Escondido in the Oaxaca state. The agency is investigating the matter and reports the turtles likely drowned in a net used to catch ojoton or scad fish, and researchers are also looking into the possibility of algae killing the specimens. Scientists at the scene say the turtles were decomposing and likely had died eight days before they were discovered. The dead turtles were removed from the sea and buried and a statement from Profepa says the agency will send officials to speak with fisherman about the damage nets can cause to other creatures. The news comes days after another 10o olive ridley turtles were found dead in the adjacent Chiapas state. The turtles live in tropical waters and the World Wildlife Fund says they're the most abundant of sea turtles but their status is considered vulnerable because "they nest in a very small number of places, and therefore any disturbance to even one nest beach could have huge repercussions on the entire population."